FCC chairman Ajit Pai has advocated for the activation of FM radio receivers built into nearly every smartphone, as part of opening remarks he made at the Future of Radio and Audio Symposium in Washington D.C. yesterday. Many smartphones sold today, including iPhones, have an FM receiver built into the LTE modem that would allow people to listen to FM radio over the air; however, many carriers and phone makers have not enabled the functionality, forcing users to use an app to stream FM radio over Wi-Fi or cellular data. 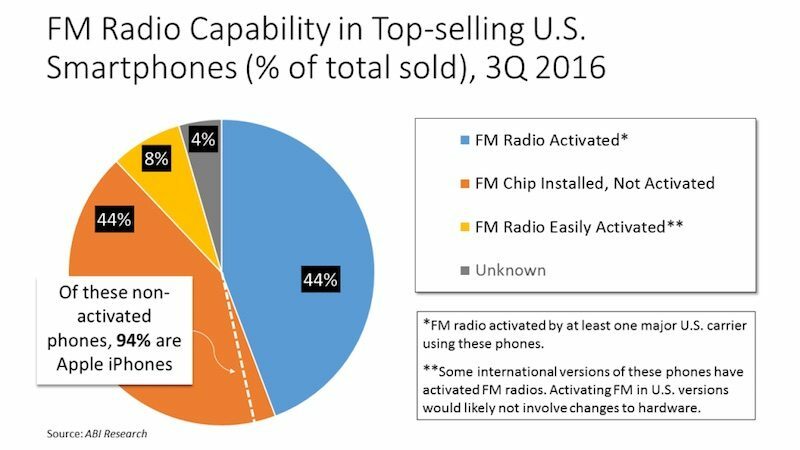 Pai cited a NAB study that found only 44% of the top-selling smartphones in the United States had activated FM receivers as of last year. The vast majority—94%—of the non-activated smartphones are iPhones, according to the study. "We could be doing a lot better," said Pai, who was appointed as FCC chairman last month. "It seems odd that every day we hear about a new smartphone app that lets you do something innovative, yet these modern-day mobile miracles don’t enable a key function offered by a 1982 Sony Walkman." 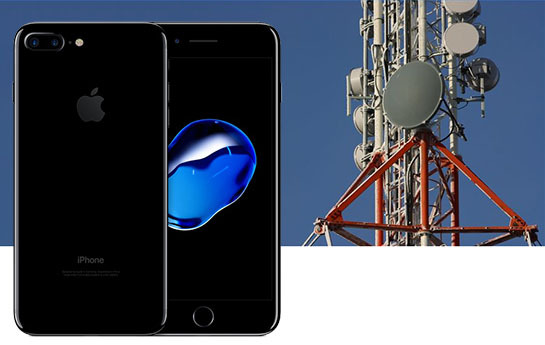 The activation of FM receivers in iPhones would have several benefits, including battery life savings, less data usage, and most importantly, the ability to receive emergency alerts over radio without service. "You could make a case for activating chips on public safety grounds alone," added Pai. "The former head of our Federal Emergency Management Administration has spoken out in support of this proposal. The FCC has an expert advisory panel on public safety issues that has also advocated enabling FM radio chips on smartphones." Pai said that while he will keep speaking out about the benefits of activating FM receivers in smartphones, he is a believer in free markets and the rule of law, and he thereby cannot support a government mandate requiring activation of these chips, nor does he believe the FCC has the power to issue said mandate. In 2015, an online campaign was launched to "free radio" on smartphones. It calls for U.S. carriers to activate the FM radio receivers in smartphones. AT&T, Verizon, Sprint, and T-Mobile now support the functionality, or will soon, on all or select Android-based smartphones. The campaign extends to Canada. Apple's stance on the activation of FM receivers in iPhones is uncertain. An additional antenna would likely be required for proper FM signal reception. The latest iPod nano, meanwhile, requires connecting headphones to listen to FM radio, as the device uses the headphone cord as an antenna to receive a signal. Oh, boy you mean I could get free advertisements over the air? No, thank you. I have a radio in my car that hasn't been turned on in years. That's the apple spirit! Because I don't use feature x, it should not be available to anyone! Why not allow both. Consumer choice. If the hardware is there...! I had no idea. Apple doesn't want people to listen to free radio (i.e. music). who listens to FM radio anymore unless they really have to? Answers: Millions and millions of people. To be precise 147 million from 2015 statistic. Apple's not going to do it because it'll allow you to listen to radio for free, rather than having to pay them for a monthly subscription. I haven't listened to FM radio in years, but that doesn't mean it shouldn't be an option. We know why it's not being done... carriers can't monetize FM radio, but they can your data usage. This would be a nice development, especially as Pai says, for the safety aspect. I have few (if any) battery-operated radios in my house and in the case of a power outage I would really like to be able to use any one of my battery-powered cellular devices to keep updated on any emergency broadcasts. Not to jump too deeply into politics, it's stuff like this that reminds me that partisanship can be set aside in order to hear a good idea and build consensus around it. It would be nice to have. Europe are pushing to switch off FM and go DAB only.